Welcome to 24/7 All Services, LLC! 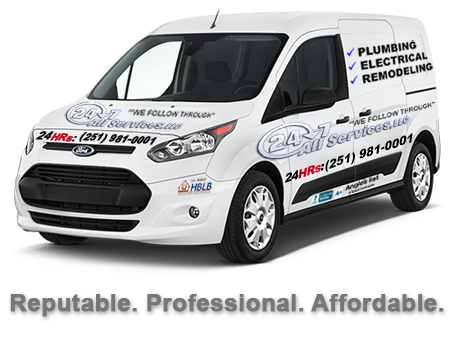 All along the gulf coast of Alabama, more and more people trust and recommend us for quality plumbing, electrical and remodeling service at a great price. Get around the clock repair service without extra after hours fees! As a licensed, insured and reputable repair service, homeowners and business owners alike depend on us for a job done right at a price that’s fair. We care about the quality of work we do and our good reputation is a testament to that. Call us for a fast, free estimate today. Remodeling– Kitchen Remodeling, Bath Remodels, Interior & Exterior Painting, Room Additions, Flooring Installs, Construction and Sheetrock Finishing, Window & Door Replacement, Cabinet Refacing, Countertop Replacement, Deck Building and much more..
Plumbing– Clogged Drains, Leaky Pipes, Water Installation, Toilet Leaks and Installs, Garbage Disposal Problems, Water Line Repair, Tub & Shower drain clogs, and many more..
Electrical– Circuit Breaker Issues, Lighting Installs, Light Switch & Outlet Repairs, Ceiling Fan Replacement, House Rewires, Electric Service Connection, Low Voltage & Landscape Lighting and more.. The video below is from a whole home remodeling project we recently completed on Ashton Court in Gulf Shores, AL. Nearly every room in this house has been completely renovated to bring it up to date with today’s most appealing design styles. When your electric water heater stops working at 7pm in the evening, you immediately know two things. First, you know you want it fixed quickly and second, you know that you’re probably going to pay through the nose for an after hours plumber. Not with 24/7 All Services! We never charge an extra fee for after hours service calls, weekends or even holidays. We always appreciate the business and treat our customers like family. In Baldwin County AL, we specialize in plumbing, electrical and home improvement emergency repairs from Gulf Shores to Bay Minette. Whatever your repair needs are, you’re sure to rest easier at night know you hired the best home repair company to get the job done properly and affordably. That’s really why more and more people along Alabama’s Gulf Coast are choosing us and recommending us to people they care about. 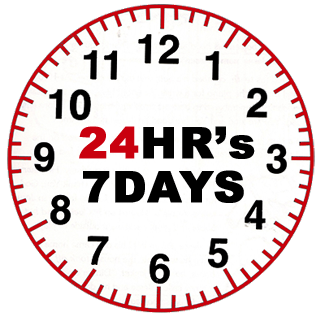 We offer 24HR repair services to homeowners and business owners throughout Baldwin County AL.